…is that you have to blog about BlogCamp. My day didn’t start well when I realised too late that I was wearing the same blue top/black cardie/typewriter necklace combination I’ve got on in that picture on the right. Holy crap, I’ve come as my blog I thought I am a 24 carat loser for sure. But then somebody came over and did the Be Seeing You peepy eye/hand gesture (as also modelled to the right) and said Is that you? So I did it back at them and said Yes it is. Brilliant. My day brightened considerably from there. People seem to like self-hosted WordPress blogs best. Though apparently Google likes Typepad best of all, reassuring me and the only other person in the room who use this platform that it’s £3 a month well spent. We all need to have Tweetmeme buttons on our blogs. Well, I’m trying. It’s floating round here somewhere so that’s a start. When tweeting links to your blog posts, you’ll get more click throughs if you Capitalise Your Words and the tweet is an unfinished sentence followed by an ellipsis (three dots). Though still no one knows why George Michael puts three dots at the end of every tweet, which I feel is one of the great mysteries of our time. The less experience you have in site design, the plainer you should keep your blog. I’m thinking of changing to an entirely blank page. Forget aiming to be on page 1 of Google, due to changing search patterns you need to be in the top 3 links on page 1. Well it’s nice to have an ambition. Being topical is becoming more important in search engine placement than having lots of backlinks. Put your keyword phrase in the headine, and first and last paragraph for maximum SEO benefits. And every 100 words or so if you can, though don’t stick too rigidly to that or your posts will start to read like they’ve been cranked out by a machine. People are searching for images more, so make sure your images have a relevant title and not just imageoo1.jpeg etc. Cakes with glitter are very nice, but will leave you with overly-sparkling chops. Wiser women than you will go to the loo to discretely sort this out, and you will remember to do the same about two hours later. Also nice is the TalkTalk Customer Experience Centre, which you don’t have to be a customer of theirs to use. So if you’re looking for a free business centre in central London where you can have a cheeky net surf, they won’t turn you away. Bangs and a Bun has got the finest toned arms I have ever seen. OK I know that is shallow, particularly when she had a lot of wise words to say, but I like weightlifting and arm muscles generally and was quite mesmerised by hers. To the point that the phrase “You are my armspiration” floated through my head, which is a horrible manglement of words that I feel a bit dirty about. If you leave the house for 24 hours, your family will suffer temporary loss of the use of their arms and fail to take the clean washing out of the machine, meaning that you have to wash it all again when you get back. Wow, thanks family. You’re the gift that keeps on giving. Dennis the Cat will also take advantage of your absence to indulge his evil side and bite through your phone charger cable. The trouble with Dennis the Cat is that he’s about 80% evil side – not what you want in a pet. Sally Whittle has achieved a lot for a girl barely out of her teens. 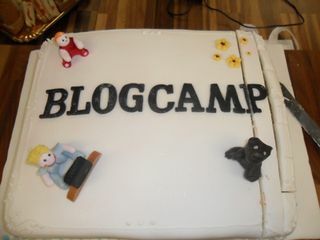 Well done Sally, and thank you for BlogCamp. BlogCampers, did I miss anything? Who says watching TV is bad for children’s imaginations?